Whether you are interested in becoming a pilot, trying a new thrilling experience, or are searching for a new hobby, an Airplane or Helicopter Introductory Flight is the perfect route. Not sure if an Introductory flight is right for you? Call today for more information! Whether you are hoping to pursue a lifelong career in aviation or simply want to cross something off of your bucket list, the Introductory Flight lesson at Tampa Bay Aviation is a great first step into the exciting world of aviation. Let one of our certified instructors become your guide in the sky as you take the controls of an aircraft for the first time. Consider this your very first flight lesson. There is no better way to discover if flying is for you. Please allow 24 hours for online purchases to process. For same-day reservations, please call us at: (727) 461-5229. Flights originate out of both Clearwater Airpark and St Pete/Clearwater International Airport. Your specific location will be confirmed when your reservation is made. The Airplane Introductory Flight is a 60-minute experience where you will be introduced to the basics of aviation. 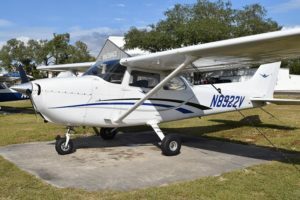 The Introductory Flight includes a 15-minute pre-flight introduction and safety briefing, and up to 45 minutes in the air at the controls of a Cessna 172 airplane. Please allow 24 hours for processing. Gift certificates are non-refundable and are valid for 6 months from the date of purchase. Take your Introductory Flight to the next level. 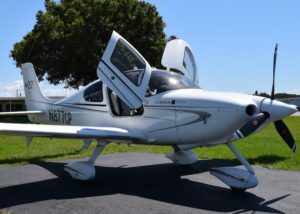 The Cirrus SR22 is the world’s best-selling single-engine four seat aircraft. Known for its Cirrus Airframe Parachute System (CAPS), the Cirrus SR22 takes safety and luxury to new heights. This Introductory Flight is a 45-minute experience that will include a 15-minute pre-flight introduction and 30 minutes at the controls. The R22 Helicopter Introductory Flight is an exciting way to truly experience what flying a helicopter is all about. Each Introductory Flight begins with approximately 30 minutes in our FAA approved helicopter simulator before the flight, covering topics such as helicopter controls and aircraft pre-flight inspection. Once ground training is done, you will hop into the pilot-in-command seat for 45 minutes of actual flight time with one of our Certified Flight Instructors in a Robinson R22 helicopter. Maximum weight of passenger 220 lbs. The R44 Introductory flight is a step up from our R44 Discovery flight. This experience allows you the opportunity to bring friends along for the ride of a lifetime! 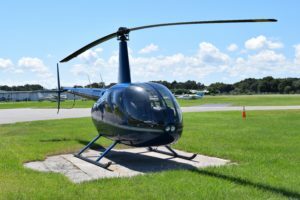 The R44 Helicopter Discovery Flight is an exciting way to truly experience what flying a helicopter is all about. Each Introductory Flight begins with approximately 30 minutes in our FAA approved helicopter simulator before the flight, covering topics such as helicopter controls and aircraft pre-flight inspection. 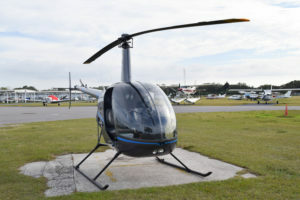 Once ground training is done, you will hop into the pilot-in-command seat for 45 minutes of actual flight time with one of our Certified Flight Instructors in a Robinson R44 helicopter. The first part of your lesson involves some basic “ground” training. Here you will learn fundamental aerodynamic principles of flight and go over safety procedures. Your instructor will answer any preliminary questions you may have at this time. Prior to flight, your instructor will walk you through a pre-flight inspection of the aircraft to give you an idea of the process the pilot goes through before each and every flight. Among other things, you will check the wings or rotor blades, lights, oil, and fuel during this inspection. Once the aircraft has passed the pre-flight inspection, you will climb inside with your instructor and he/she will explain the flight controls, including the yoke, throttle, and rudder pedals or the collective, cyclic and anti-torque pedals and how to use them to control the aircraft. With the ground portion of the lesson completed, it will be time to take to the skies. The flying portion of the lesson is a full hands-on experience that allows you to actually fly the aircraft with assistance from your instructor. You will learn how to turn, climb, descend, and other basic maneuvers. During the flight, the student can choose to fly the aircraft as much or as little as they would like, depending on their level of comfort. Once you return, your instructor can answer any questions that may have come to mind during your flight. In most cases, this experience will spark an interest in aviation and leave you eager to begin flight training. If this is the case, your instructor will be able to provide you with all the necessary information that will enable you to begin your training as soon as you are ready. 24-hour cancellation notice required. Credit card required upon reservation. Failure to abide by cancellation policy will result in cancellation fee processing. All sales are final. Gift Certificates are valid for six months and are non-refundable. “Known to be the best Part 61 school for a reason!